This quote always makes me reflect on my professional journey and how profoundly some experiences have shaped my career trajectory and approach to life. As the first girl in my family to complete high school, college and finally earn my Ph.D., I am fully aware of how certain experiences in my formative years conditioned my thinking and gave me the courage to hang on and move ahead. Today, I am honored and humbled to be part of a movement that is offering one such experience to girls across the globe – an experience to learn, fail, seek support and create something! Technovation, offered by Iridescent, is the world’s largest technology entrepreneurship program for young girls (ages 10-18). This program offers young girls a unique experience to work in a team with an adult mentor to solve a problem in their community using technology. More than teaching technology or entrepreneurship, this program aims to inspire young girls to be lifelong learners, problem solvers, and community leaders. Irrespective of the career choices they make, Technovation seeks to provide an experience where young girls can develop a wide range of professional and personal skills and make informed education and career decisions. Technovation, currently in its 8th year, started as an in-person mentoring program with 24 girls at Google in Silicon Valley. Coming out of a Startup Weekend, the idea was to provide a safe sandbox for young girls to have the experience of launching a technology start-up. Under the folds of Iridescent, the program expanded to select US locations in the second year. Finally, the need to offer the program beyond major cities prompted the need to offer a virtual curriculum and support network. Today, Technovation is in 103 countries and has impacted 15,000 girls. We’ve got a new award structure! Starting in 2018, we’ll be using a new award structure to distribute scholarships to top-placing teams. We will be using this structure moving forward, and hope that this clarifies the judging process and how scholarships are distributed. What does this mean for you, as a team, mentor, regional ambassador, or parent? Let’s get to it! Beginning in 2018, we will refer to awards as scholarships, as this is a better description of the purpose of the money given to top-placing teams at World Pitch. We will be awarding a Gold Scholarship and Silver Scholarship to teams in each division, as well as Regional Winner Scholarships. Technovation Gold Scholarship – This scholarship is awarded to the team that comes in first in their division at World Pitch. 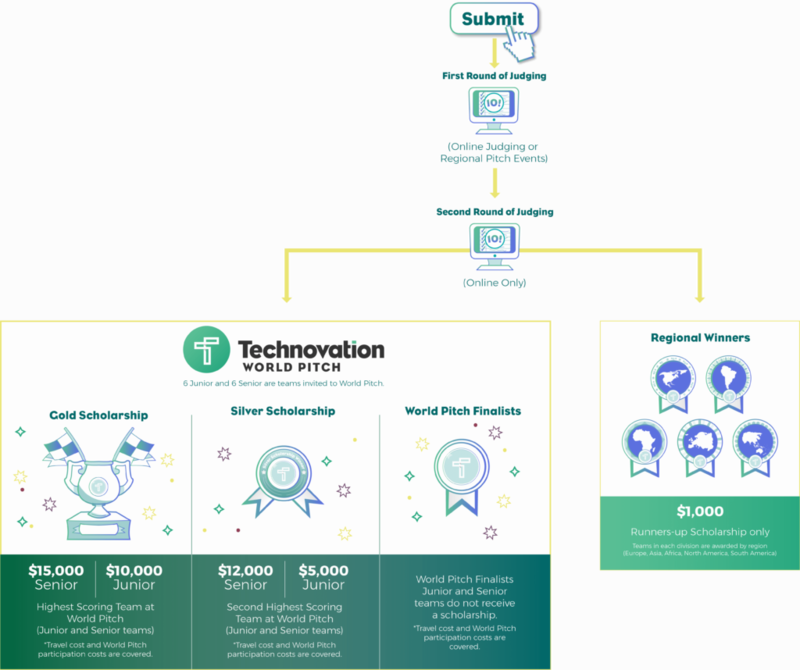 Technovation Silver Scholarship – This scholarship is awarded to the team that comes in second in their division at World Pitch. How many teams will attend the World Pitch Summit? 12 teams in total will attend World Pitch as finalists. 6 teams from the junior division, and 6 teams from the senior division. Travel costs and World Pitch participation costs are covered for these teams. Do the finalist teams who do not receive the Gold Scholarship or Silver Scholarship in their division receive any scholarships? No. Finalist teams who do not receive Gold or Silver scholarships will not receive scholarships. Their prize is being flown in to attend the World Pitch Summit, field trips to tech companies in the Silicon Valley and tour of San Francisco. Are Regional Pitch Event winners the same as Regional Winners? No. Regional Pitch Events are judged separately from the judging process for scholarships. Will teams who place first in in-person Regional Pitch Events be guaranteed a spot at World Pitch? Will they be guaranteed to receive the Bronze Scholarship for their division and region? No. Regional Pitch Events are separate from the judging process for the scholarships. Top scoring team/s will qualify to move to second round of judging but are not guaranteed a spot at World Pitch or scholarships. Help us spread the word – talk to your team, your mentor, your regional ambassador and other participants to make sure they’re aware of the award structure. We’re so excited to share that Salesforce is partnering with Technovation for 2017-2018! We’ve been working with Salesforce for years, and are proud to partner with them for the upcoming season, expand the program, and inspire young women to see their power as creators and entrepreneurs. Check out the announcement from Salesforce, and read on for our CEO Tara’s perspective on our ongoing work with Salesforce. Diversity and Inclusion wasn’t a term a few years ago as you can see from the Google Trends depiction of interest in this term from 2004 to now. It is exciting to see the growing attention around engaging and supporting underrepresented groups in engineering and technology. And we can and should aim really high in these efforts. But there is also room for innovation here. The idea of “Shared Value” developed by Michael Porter (the leading authority on business strategy and competitiveness) is an intriguing challenge to explore here. What are the most innovative ways in which corporations can integrate social responsibility into their value chain? My favorite example is that of the Toyota Prius. Through the Prius, Toyota was able to move ahead as an environmentally conscious corporation, while also launching a hugely successful, innovative product. Another notable example is that of CVS and its strategy to stop the sale of all tobacco products in 2014, foregoing $2 billion in sales revenue. Instead they launched a comprehensive smoking cessation program in stores and established themselves as thought leaders among health retailers. Porter says that businesses acting as businesses (not just as charitable givers or compliance to corporate citizenship), opens up strategic opportunities to create competitive advantage, while driving the next wave of innovation, productivity, and economic growth. That’s why I am drawn to the problem of how best to create “Shared Value” while thinking about Diversity and Inclusion — especially for the technology industry, where the value chain is focused mostly around human capital. One notable example has been Salesforce and their integrated 1-1-1 commitment to communities. We started working with Salesforce employees in 2014, engaging them as mentors in our 100-hour technology entrepreneurship program for girls – Technovation. Salesforce mentors supported teams of middle and high school girls to identify a problem in their community, develop a mobile app and launch a startup. 58% of mentors increased their technical skills around mobile computing, design thinking and product development, 67% increased their knowledge about entrepreneurship and 73% learned to be effective mentors. When I first told my QA engineer friend, Gilda, that I wanted to learn how to program in C, she couldn’t understand why an English teacher would want to learn to code. Yet, a couple of weeks later, Gilda was tutoring me on my CS50 homework, and we set the foundations for our social enterprise, C Girls Code. Two years later, we’ve brought Technovation Challenge to Central Mexico. Gilda convinced me of the importance of sharing our knowledge and teaching other women and girls about entrepreneurship and programming with Technovation Challenge. And just like she was willing to help me when I first sat down to learn about conditionals and loops, I understood that I had to do the same for young women. Gilda and I have helped get the word out and assemble a team of mentors who are working with twenty girls from a halfway house. We have encountered challenges along the way, but we’ve also found so much support and willingness from our community, our friends and family. We’ve had to take baby steps with our girls, many of whom don’t get to use a computer regularly. So when our girls learned to test their very first app using the App Inventor, we couldn’t have been prouder. We even have a non-girl team (I’m mentoring my son and three of his friends). Technovation Challenge has allowed me to live something that not only is important but in alignment with my own interests and life-long goals. I believe that I must be a part of the positive change by setting a positive example and giving back to my community. As a mother, I want my children to see me doing just that and to understand why it is important for us to be the change we want to see in the world. During the time that I’ve been volunteering with Technovation Challenge, I became unemployed. I decided to use my time to bring to together my writing skills, online experience, and digital media know-how to author a book for Mexican immigrants living in the United States. Deported: A Survival Guide for Natural Born Mexicans is a culmination of what I try to do every day (be of service and create value) and how I want to be remembered in this world: as someone who was a woman for a change. Alma Maria Rinasz is the author of Deported: A Survival Guide for Natural Born Mexicans, and a 2017 Technovation Mentor. This is the first in a series of open letters written to Technovation students by their supporters. People around the world are impressed by the young women who participate in Technovation and want to cheer you all on and offer some advice and words of encouragement! You’re more than half way through your program with Iridescent Learning. I’ve been following your stories and ideas that you’re bringing to life. What you are doing is incredible: You are taking a stand for your own future and learning valuable skills in how to create the change you want to see in your life, your family, community and the world. I am sure you’ve come across challenges and there have been times when you wanted to quit – maybe your team wasn’t communicating or working together, or your MVP (prototype) failed, or maybe you’re behind on deadlines. But, you didn’t quit and that shows me how dedicated you are to the project and to bettering yourself. You have invested in the greatest thing ever: YOU! Everything you are learning will be with you for the rest of your life. You are growing from the challenges, mistakes and the success you achieve. Keep moving forward and persevering with your project because you are becoming a person who others see as driven, determined and an inspiration to help others to create something in their own lives. We recently had the chance to catch up with Briana Berger, who participated in Technovation in 2016 and was named a semi-finalist for her app SleepBeep. Read on to hear about her early experiences with technology, the challenges she’s faced in tech, and her advice to young women who are interested in technology and entrepreneurship. My name is Briana Berger. I’m a seventeen year-old Technovation Alumni from Gainesville, FL. I love to understand the ins and outs of everything. I always ask questions, and I think that my love for code grew out of that. It also probably explains why my toddler-self “researched” why baked cookies taste good by eating the cookie dough. As my yearning to learn grew, I have become a leader in my community for events and in coding. Technovation recently had the chance to reconnect with Soumya who is a 2015 Alumna and hear about her experience with tech, what she’s working on now, and what advice she has to girls interested in technology and entrepreneurship. My name is Soumya Tejam and I participated in the Technovation Challenge in the 2015 season. My world pitch experience has in the most cliched manner changed my life. In the past two years, I’ve gone from zero coding experience to teaching a group of underprivileged girls in my community how to code, starting my own company and developing my app Cappable. The app that I built for Technovation is called Cappable and it acts as a bridge connecting physically challenged job aspirants with corporations willing to hire them and NGO’s aiming to help them. It will be available for Android and iOS very soon and through the process of programming it, I’ve enriched my programming skills which I hope to implement in other projects. I’ve got positive feedback from the people who I hope will use this app and I can’t wait to see it in action. Since World Pitch, I have also founded a business venture — BookBite. Founded in the summer of 2016, BookBite is a subscription box service thats sends out a curated package containing a Young Adult novel, short stories by budding novelists, bookish goodies, and an exciting online experience which gives you access to discussion forums and online downloadables. I started BookBite because I noticed the lack of passionate readers in our community and sought to change that attitude among my peers. Through the process I’ve learnt a good load about running a business, from customer acquisition to engagement and retainment. Through BookBite, I’ve run competitions, BookTalks, donation drives, and reading sessions. I’ve also gotten the opportunity to present my venture to Sandy Carter and speak at the IBM India Onward conference with Vanitha Narayanan in Delhi about the work that I’ve been doing. We are often asked if men can mentor in Technovation. The answer is yes, because being a Technovation mentor is about supporting young women and their interests in technology and entrepreneurship. Technovation mentors young women develop their confidence and leadership skills as well as their technical skills. It is also helpful for girls to see men and women working together to promote STEM education for girls. We do encourage men who want to volunteer as mentors do so in partnership with a woman. This week, we would like to introduce you to a male mentor, Ugi Augustine from Calibar, Nigeria. We hope that his experience as a male mentor will encourage other men to volunteer. We also asked Ugi how he supports his team. Why did you want to mentor in an all girl’s program? The idea of having women develop software moved me into becoming a Technovation mentor. Professionally, I already impact knowledge and urge my employees and team members to achieve the unthinkable, but so far we have no women on our team. I believe that one or all of the ladies we currently mentor would become very good software developers. Grace Ihejiamaizu had introduced me to team CHARIS and [told me] how they won the Technovation competition. I volunteered to help them develop their app Discardious (which my team and I are currently still helping them with), and we have not just assisted with development of their app, we are also training them so they get regular classes every week. My hope is that they become outstanding young software engineers and do well, just like their male counterparts. I mentor a lot of people, not just the girls, but it’s been a difficult process mentoring the ladies. I have actually discovered that they seem not to believe that coding can change them and take them places like the men that come to study with us. Most of the men let go of their chosen careers and adopt software as a way to make it in life–on the other hand, the ladies tend to hold on to the careers they already have. With team CHARIS and team SCEPH, I have seen young ladies who really want to make a difference through technology. What advice do you have for all mentors? To mentor the girls, the first thing I did was to make them believe in themselves and their abilities to change their communities with ideas. I also taught them to see failure as a normal thing, and understand that a lot of people fail, but then get better after they try again. I have failed so many times in trying to set my company up, so I use my life experiences to inspire them. As a mentor, my job ends in showing the way, the will is invented by the girls, and this is what I make them clearly understand. Technovation recently had the chance to talk with Houyem Boukthir, a 2015 Technovation participant from Tunisia. We got some great advice for young women interested in tech, learned how Houyem worked though challenges during the program, and what inspires her. My name is Houyem Boukthir, I’m 18 years old and I live in Ariana, Tunisia. When I was 8 I dreamt of founding a car manufacturer producing only autonomous and ecofriendly vehicles, therefore reducing stress, car accidents and pollution. When presenting the idea to my father he replied that I needed a huge amount of money in order to fulfill my dream. Thanks to my childhood optimism, that didn’t stop me — on the contrary that’s when my long journey of saving money started. I first bought a piggy bank and started saving all my pocket money depriving myself of stuff other kids my age would buy. As I grew older I realized that money wasn’t the most important thing I needed. In fact, I needed some skills that neither school could teach me nor money could buy. I got myself more involved in community services, jumped in every event and training I’ve heard of and with 5 other friends we founded the first club in our school counting more than 50 members. I was obsessed with the idea of becoming a better version of myself bit by bit each day, and turning into a person who worked for change and success instead of only dreaming of it. That’s when teammate Narmine introduced me to Technovation; an experience that I’ll never forget. It made me more aware of how far I have come as an individual and how hard I will work in order to achieve my goals. Let’s talk about the focus of this year’s challenge — Sustainable Development Goals (which you may have seen referred to in our materials as SDGs)! This year we’re challenging young women around the world to apply their creativity, ingenuity, and determination to develop a solution to a problem that falls into one of six SDG tracks: poverty, the environment, peace, equality, education, and health. These tracks are taken from the United Nation’s Sustainable Development Goals — a set of goals to promote peace, protect the planet, and ensure prosperity for all. We are asking students to focus on these six tracks because we believe that tying this year’s challenge to global initiatives will help underscore the international nature of the program, the power of collective work, and the need for socially-conscious design. We want to invite young women across the world to see themselves as people who can solve big problems — and help them understand that they can start to solve them now. The UN has defined targets to achieve for each of their Sustainable Development Goals. Technovation teams will be doing their part to help reach these targets in the 6 tracks we’ve selected, and to make a difference. The global problems we’re facing are large and numerous — but we believe that young women have the ideas, drive, and determination to lead the change for a better world.